嗜好 Hobbies: Swimming, badminton and watching Jackie Chan movies. He also enjoys football -he supports Liverpool and enjoyed a backstage tour of Anfield in April 2007. 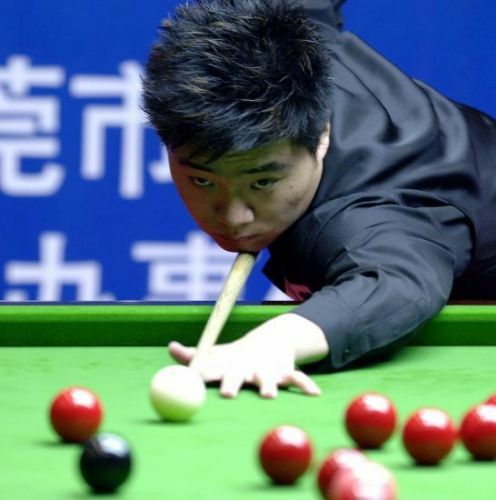 Ding started playing snooker at the age of eight, when his father took him to the Chinese national team training centre near Shanghai. His father persuaded his mother to sell their house in order for Ding to continue playing snooker as a career. Ding shot to international prominence in 2002, when he won the Asian Under-21 Championship, the Asian Championship and the IBSF World Under-21 Championship. He was unable to progress much in 2003, as both the Asian Championship and Under-21 Championship had to be cancelled because of the SARS virus crisis, but he was a semi-finalist in the IBSF World Under-21 championship, and was awarded a Main Tour concession by the WPBSA, which enabled him to turn professional in September 2003. In 2003, he became the number one ranked player in China.